While watching Monday night’s game between the Thunder and the Spurs, I had a thought that was very unlike the thoughts I usually have. I was watching the Thunder head into the locker room after getting it handed to them in the first half, and I actually had a cohesive moment of clarity where I expressed sympathy for someone who is crazy stupid rich. 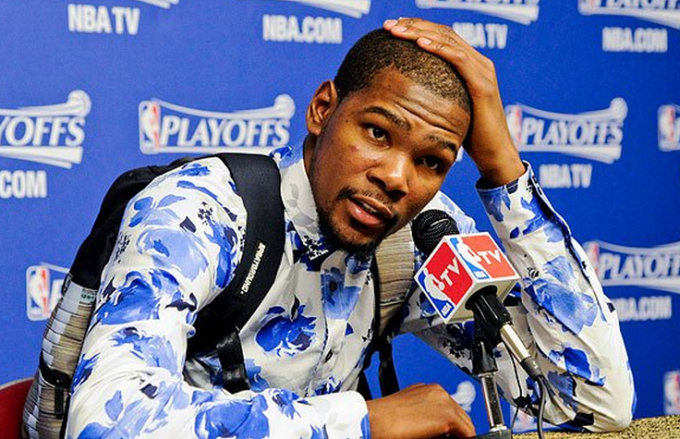 I feel kind of bad for Kevin Durant. 5 reasons hockey is the greatest sport in the known galaxy. #5- Absurd toughness. The current best player in the NBA is Lebron. In the NHL its Sid. Lebron got carried off the court (CARRIED!) because of a leg cramp. Sid played three weeks after having his jaw shattered like a Lego house. But that’s nothing compared to Gregory Campbell (broken Leg) Andrew Shaw (Broken Orbital bone) Brenden Morrow (split kneecap) and Brian Bickell (you name it, it was broken/strained/pulled/bruised.). Those guys had injuries that would put most people in the hospital and didn’t miss a single shift, much let themselves be carried off the ice. In hockey that kind of effort and sacrifice is expected. 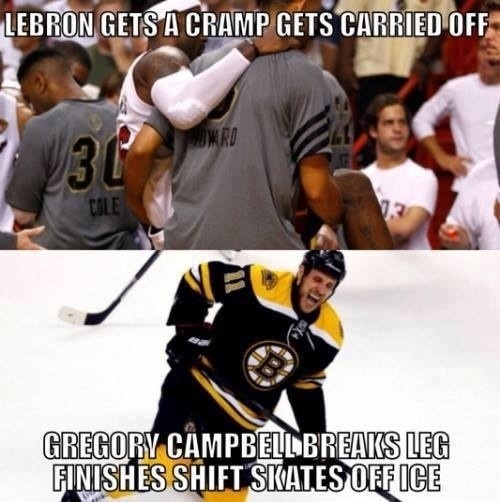 The only league that has the toughness and grit of hockey is the NFL…speaking of which. The NBA Draft is a lot like a garage sale. Like garage sales, only a handful of items (if any) hold any value. If you’re lucky, you can end up with a sparsely used flat screen TV or some designer shirts that were too big for their owner. But those items move quickly. If you arrive too late, you’re left with few options. You might think, “Ahh what the hell, I guess I might use an automatic playing card shuffler one day. It’s only $0.75, screw it. Why not.” That’s the mindset of NBA teams picking in the late first through second round of the NBA draft. The only difference is that unlike a garage sale where you can walk away if you don’t find anything worth buying, NBA teams are forced to draft players. If given a choice, I’m sure some teams would rather forfeit their pick than have to go through the formality of drafting a guy who they know won’t play a minute for their team. In the NBA draft, once that one-of-a-kind antique bookshelf is gone in the early first round, teams have no choice but to drop $0.25 on that pair of Mickey Mouse oven-mitts. This isn’t a product of a lack of young talent. It’s simply the nature of the sport. NBA teams are only allowed to have 15 players under contract, meaning there can only be 450 active NBA players total. Only 12 of those 15 players can suit up for a game. Even further, only seven or eight of those players will get any meaningful playing time. For those reasons, if you have two or three superstar players, you’re pretty much set. NBA teams don’t need a constant stream of young talent to be successful like NFL teams. If you’re able to get a few great players and lock them up for the future, the NBA draft doesn’t really matter to your team. 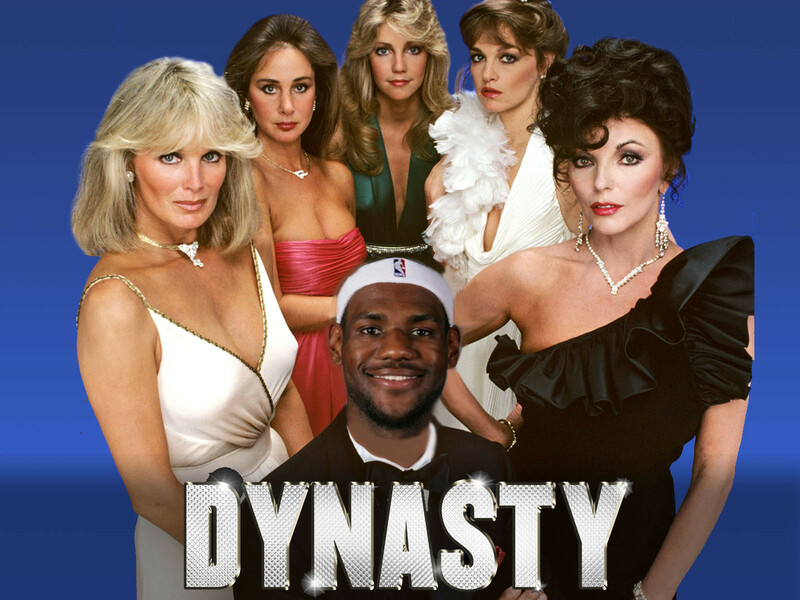 This is the case with the Miami Heat. The Heat didn’t have any draft picks in last week’s draft and they’re still the best team in the NBA. Most of the players drafted last week won’t really matter in the grand scheme of things. A third of them probably won’t play more than 50 games in the NBA. A few of them will toil away in the D-League or on some international team and won’t ever get a chance to don an NBA uniform. The majority will become just another replaceable role player. That’s really all the NBA draft does: it just adds a new crop of average players who will play minor roles on four or five different teams over their career, only to retire into anonymity. You may think your team drafted the next Tim Duncan or LeBron James but its more likely that they just drafted the next Nazr Mohammed or Mike Miller. It remains to be seen if this year’s NBA draft will produce any superstars. But if it doesn’t, then this draft didn’t really matter. Below, I have included a list of this year’s lottery picks, along with their closest “average NBA player” comparison. These aren’t necessarily my predictions of how these picks will pan out. Rather, this is more of a “most average-case-scenario” for each player. I may overlook certain guys who will turn out to be superstars. But overall, I’ll be right more times than I’m wrong. I know you are going to be shocked by this, but here comes another Dubsism rant that flies in the face of popular opinion and the bilge being pumped out by ESPN. First, let’s be magnanimous. The Heat won their second straight NBA Championship last night, and for that, I only have one word. Congratulations. Winning a title in any professional league is tough enough; winning consecutive championships is tougher than getting through an afternoon with your in-laws while simultaneously battling a toothache and hemorrhoidal flare-up. And the Oscar goes too.. Such a ridiculous comment was made by none other than Dwayne Wade. Finals MVP. 9x All-Star. 2x Champion. Scoring champion and 3x all NBA defensive team. Yea…that Dwayne Wade. Defending flopping as an essential and integral part of the NBA. So much so that eliminating it would mean the end of the league. And he said this with a straight face. He was totally serious. I know I’m not the first person to say it, but this year’s NBA playoffs will be extremely entertaining. As you can see from my predictions above, I have the Miami Heat winning back-to-back championships. The competition level has increased a lot since last year but I don’t think any team has reached the Heat’s level. With the 2013 NBA season winding down, I’ve decided to give out my regular season awards and nominations. This year was pretty standard as far as NBA seasons go. Like every year, you had your great teams, your bad teams… and your Charlotte Bobcats. You had your good players, your scrubs… and Luke Walton. But why only give awards to the “best” players? Why not give players awards for being a scrub, having stupid hair or acting like a knuckle-head? That is exactly what this article will set out to do. Disagree with me? Think I’m an idiot? Comment below to state your case.